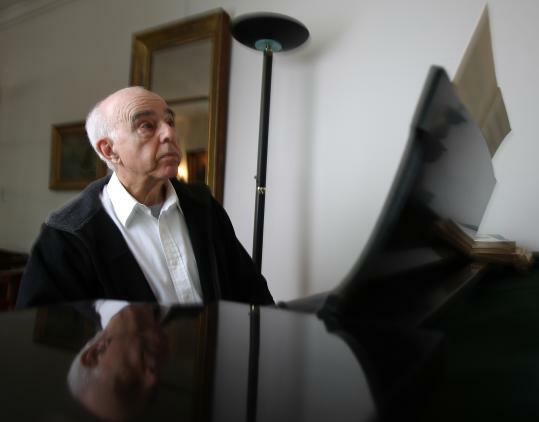 If you go to a classical concert in Boston - one with music that really matters, whether old or new - there’s a good chance you’ll find the composer Yehudi Wyner perched near the back of the hall, surveying the scene with warm eyes and a knowing presence. Bump into him at intermission and he might dispense a wry joke or a casual but penetrating remark about what you’ve just heard. He’s not there simply for a pleasant night out but because, in short, he is one of the most actively engaged composers you will meet. As this disc alone makes clear, Wyner is a rare breed of composer. He has lived through a century of musical polemics but never cast his lot with any one of the dom inant stylistic schools of his day. He has spent decades teaching at universities (Yale, SUNY Purchase, and until his retirement a few years ago, Brandeis) but he does not write what could be called academic music. To know the music is also to know the man. The other day, Wyner took a break between rehearsals for an upcoming recording and met for a conversation in his studio. The space was once a freestanding garage just behind his Medford home but Wyner has converted it into a kind of Mahlerian composer’s hut, crowded with a piano, scores, recordings, and memories. He is a natural raconteur who talks like he writes music, with a crisp precision of language - he might dismiss a piece as “Victorian fustian’’ or simply as “repellent’’ - but also with colloquialisms tossed in to season the mix, sometimes from the Yiddish he learned as a boy. He began a conversation that spanned several hours by speaking about his father, the composer Lazar Weiner, and continued with reflections on his own journey in music. To be sure, Wyner’s story rightly begins on the day that his father, the son of a shoemaker in Ukraine, was plucked from his town by a passing musician and given the opportunity to sing in a choir at the great Brodsky Synagogue of Kiev. Lazar went on to become a boy soprano in the Kiev opera and even sang alongside the legendary Russian bass Feodor Chaliapin. He immigrated to New York and ultimately became the leading composer of Yiddish art songs. Wyner (whose last name was changed by his father when he was a boy) is deeply admiring of his father’s legacy and has labored to help preserve it. Wyner grew up in New York, and his musical gifts were spotted early and encouraged at Juilliard. His piano technique was good enough for him to consider a solo career but he could not reconcile himself to playing the same repertoire again and again, nor did he think he had the prodigious memory required to succeed as a concert virtuoso. Composing beckoned, and two of the most magnetic teachers at the time were both Ã©migrÃ©s from Hitler’s Europe: Arnold Schoenberg, who taught at two schools in Southern California, and Paul Hindemith, who taught at Yale. Wyner was more drawn to Hindemith’s music at that time, so off he went to New Haven, only to learn upon arrival that Hindemith did not have real contact with undergraduates. Years later, when Wyner embarked on graduate study at Yale, he finally got the old man’s attention. After completing his studies Wyner won a fellowship to spend three idyllic years at the American Academy in Rome, living in a communal setting with poets and writers of all stripes . Elliott Carter was also there, and Wyner had the opportunity to immerse himself in Carter’s music and in some essential scores by revolutionary composers of the early 20th century. Capping his experience in Rome, Wyner wrote his landmark Concert Duo, a work that forcefully cast aside his early neoclassical leanings and plunged into a more liberated, post-expressionistic style. Scored for violin and piano, it is a brief piece but one of coiled intensity and rhapsodic expression. It was completed in 1957, and Wyner played on an early recording with the violinist Matthew Raimondi. When he eventually began teaching composition at Yale, he continued his conducting work with the New Haven Opera, and his piano playing with the Bach Aria Group. He came to teach at Brandeis University in 1986. Strange as this may sound, a composer with so much practical performance experience is a rarity these days. For most of the history of Western classical music, composers were also performers but over the course of the 20th century, to the great danger of the art as a whole, they came to see themselves as specialists removed from everyday performance of their own music, or anyone else’s for that matter. Wyner is a counterexample, a grounded musician whose music does not breathe the rarefied air of a lonely garret but rather revels in the sheer physicality of performance and the rush of communicating with a live audience. Surveying Wyner’s catalog of work, one is struck by the range of his expression, from liturgical music like his “Friday Evening Service’’ to orchestral, choral, and chamber works of various combinations. Basic materials often reveal surprising depths, and works such as the “Second Madrigal’’ and “On This Most Voluptuous Night’’ contain landscapes of striking silvery beauty. Many pieces feature the soprano voice and were written for his wife, Susan Davenny Wyner, who was a widely admired singer before a biking accident in New York ended her days as a vocalist. She is now a conductor and has recorded much of her husband’s work, including the rugged yet passionately lyrical Cello Concerto that appears on the new disc alongside Wyner’s absorbing “Lyric Harmony’’ and “Epilogue: in memory of Jacob Druckman,’’ both in stirring performances. But it is the composer’s Piano Concerto, by turns poised and rollicking, that opens the new disc and grabs attention from the start. It is packed with references yet somehow never feels like pastiche. Wyner often unabashedly brings hints of jazz and the popular music of his childhood into his concert pieces, and near the conclusion of the concerto, a furious boogie-woogie erupts and then charges through to the end. The title of the work, “Chiavi in Mano,’’ is an Italian expression that means “keys in hand,’’ and Wyner chose it because the piece is designed to lie comfortably beneath the soloist’s fingers even in passages of immense difficulty. For his part, Levin gives an exhilarating performance, full of adrenaline and risk-taking, strong sonorities and clear textures. Back in Wyner’s studio, the lunch hour beckoned and the composer offered a few parting comments. The politics of musical style have stymied the careers and sometimes the creativity of plenty of composers over the decades, and Wyner was asked if he ever felt pressure to adopt the strict 12-tone language that once reigned supreme in the academy. He responded with candor, and a with a wider view.